At SBL, I had the great privilege of responding to Dr. Luke Timothy Johnson in a panel discussion regarding his book Among the Gentiles. Johnson is a legend and I was quaking in my boots (sneakers really) just thinking about it, but it was a lot of fun and he is a lively speaker. I just finished reading LT Johnson’s outstanding Prophetic Jesus, Prophetic Church: The Challenge of Luke-Acts to Contemporary Christians (Eerdmans, 2011). Here is what we might call a prophetic commentary. Johnson’s work is exactly the kind of Biblical studies research and thinking that can really change the church for the better – it is neither fluff nor esoteric ramblings about philology or history. What is the book all about? Johnson believes that the Gospel acc to Luke and Acts (as two parts of one great prophetic narrative by Luke) is especially fit for igniting a fire under Christian communities, encouraging them to live our their vocation in God, guided by Christ and empowered by the Spirit. One major plank in his argument is that it is wrong when scholars think of the Jesus of the Gospel of Luke as prophetic, but not the church of the book of Acts as prophetic. Luke-Acts is designed in such a way as to demonstrate Jesus as a prophet in Luke, then the early apostolic church carries on Jesus’ prophetic ministry in Acts, and this is a model for the church today to continue this prophetic ministry. [Luke] could not have imagined that the process of making his composition part of the NT canon would separate the two parts of his single story, so that his account of ‘what Jesus did’ would appear with the other Gospels, while his account of what Jesus’ witnesses did and said would serve to introduce the letters of Paul (p. 1). Johnson, in a way, is discouraging us from reading the NT primarily according to canonical order. He argues, “canonical arrangement does not determine how canonical compositions are to be read” (3). [Brevard Childs is rolling around in his grave!] Johnson goes on: “We are not obliged to read Hebrews as a letter written by Paul simply because many early Christians so regarded it and some ancient manuscripts place it among Paul’s letters. Nor does the canonical placement of James or Revelation demand that we read them as either later or lesser than Paul. The accidents of canonical arrangement do not constrain interpretation” (3). 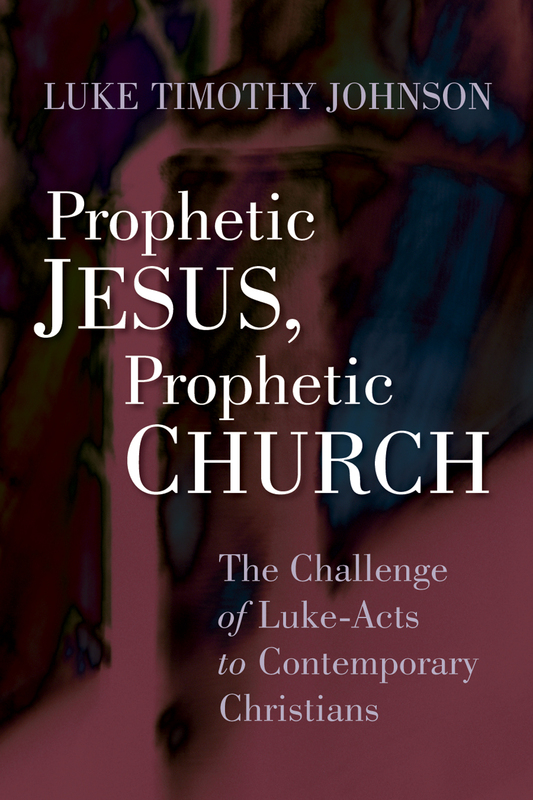 OK, I don’t think Johnson has to work too hard to convince me to read Luke and Acts together, but what does it mean to see prophetic Jesus and prophetic church? Basically, using the OT models, a prophet is marked by “being inspired by the Holy Spirit, speaking God’s word, embodying God’s vision for humans, enacting the vision through signs and wonders, and bearing witness to God in the world” (p. 4). Here is where Johnson is stepping out and being radical: “Luke shows the church in Acts to be even more radical than the prophet Jesus” (4). Part of what Johnson is getting at is that Acts is not just a second part of a book of history. It has a prophetic voice which calls out to the church. The substantive message of the book takes place in 5 chapters: the prophetic Spirit, the prophetic word, prophetic embodiment, prophetic enactment, and prophetic witness. For each chapter, first Johnson describes the prophetic element as it appears in Luke, then Acts, and then he offers “Challenges for the Church Today.” This ends up being a kind of thematic commentary with application, but because it is Johnson communicating, it packs a wollup of a theological punch! This involves habits of the prophet like healing and exorcising demons. Plenty of this going on in Luke-Acts and it is surely a sign of God’s full-force attack against the powers of the world beset by sin. But I was very curious what Johnson would do when it comes to translating this for the church today. He tends to take the evil and demons of the world like NT Wright does, calling governmental corruption “evil” and fighting all kinds of trafficing and abuse as “demonic.” What about “healing”? Johnson does not talk plainly about it in the ways I was hoping, but his concluding thoughts are very apropos. Johnson acknowledges that many Christians today think they know what “witnessing” is – telling people they are sinners and to turn to Jesus. He does affirm that witnessing does require words, but it is not words alone. This book was a breath of fresh air for me – and not just because it is free of footnotes/endnotes! If you are teaching a course on Luke or Acts, I would strongly urge you to consider having your students engage with this book – especially if they are planning to be in ministry leadership! But Jesus was not in any sense a Christian, nor did he create the religion about him – aka Christian-ism as a power and control seeking ideology. Every minute fraction of Christianity was created after the brutal murder of Jesus. And mostly long after by people who never ever met Jesus up close and personal in a living-breathing-feeling human form. Corpses (or dead human beings) are incapable of creating anything, especially absurd ideas about “their” presumed “resurrection”.